🎖 Plugin ranks 2,071 amongst 50,000+ plugins. 🎂 This plugin is going to celebrate it's 5th anniversary after 7 months. Doesn't work for multiple custom days like it shouldAuthor responseIt is not advertised as a multi-day booking plugin. Booked was built for appointments, and arguably most appointments are for a specific time slot, not multiple days.Any chance you can remove this 1 star review? Seems a bit unfair. The plugin is great. Does what it says and comes with a nice user experience (for the person booking an appointment). However, a recent release brought a lot of bugs, and rendered the plugin impossible to book appointments through. Bugs that are easy to spot and rather easy to fix (undefined variables, commas put in wrong places etc.). My rating is low because I'd expect the author to properly test before releasing code. One of the easiest wordpress plugins I have used. 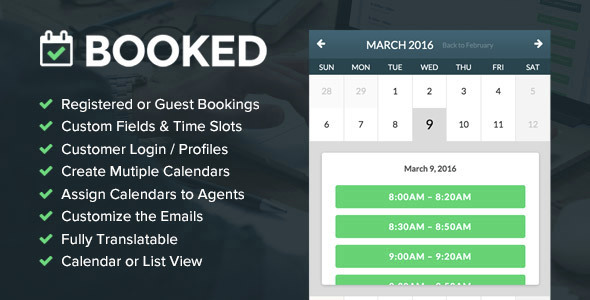 Some font changes are needed but still a great booking plugin for me. Sorry mate, it took 9 days to reply to my message and the very first one (23 days old) was completely ignored. You wasn't even willing to take a look into issues mentioned, if you did, you'd realize that there are certain problems. So instead of improving your plugin for the sake of all of its users, you rather replied in good old "not mine fault" fashion. I'm here at Envato for over 7 years, you can trick others but not me. Until this day I never made a review, this is my first review ever and it's because the ignorance you showed.Best regards! 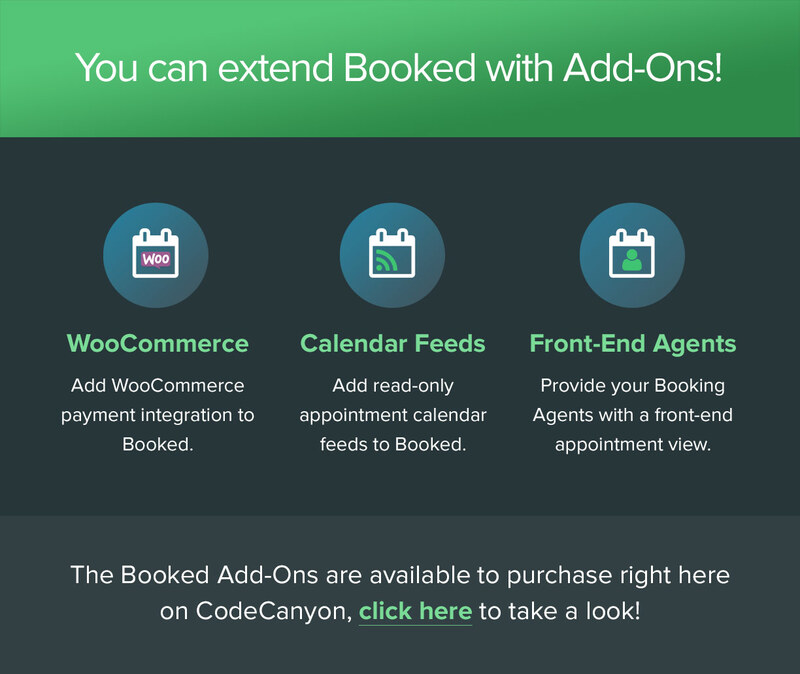 If you're looking for an awesome appointment booking plugin than look no further, its super simple to setup, very intuitive to to use, feature availability is very impressive & the code quality is top notch, highly recommended! Nice work Justin! This is absolutely one of the best plugins I have ever invested in. Very well designed and thought out, clean and thorough, with superb functionality and options. Thank you. Well done to you and keep it up. You are an inspiration and a benchmark. A great plugin. Simple, yet powerful. Worth every cent. Useful plugin. I hope the author will support it. Thank you.